Meeting assistance at the airport and transfer to your pre booked hotel. Overnight stay will be at hotel. Breakfast at hotel. Morning leave for full day guided city tour of Old & New dilhi visiting Red Fort, Jama Masjid, Raj Ghat, India Gate, President's House, Birla Mandir, Lotus Temple, Qutab Minar, Akshardham Temple. Evening at leisure. Overnight at hotel. Breakfast at hotel. 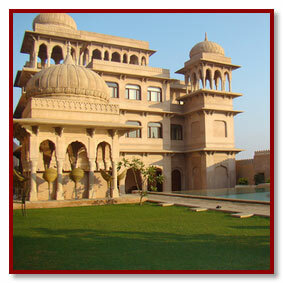 Morning Leave by car/Coach to Mandawa in Shekhavati Region, upon arrival transfer to hotel Castle Mandawa. Afternoon leave for half dy city tour visitng various Havelis (Small Palace type houses with beautiful paintings reflecting Hindu culture). Overnight at hotel. Breakfast at hotel. 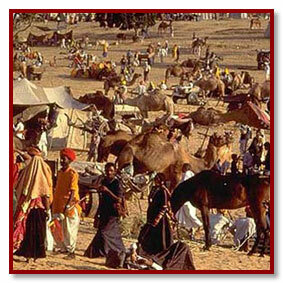 Full day free to Explore the Shekhawati region visiting various villages like Dundlod, Mukundgarh, Nawalgarh etc. Overnight at hotel. Breakfast at hotel. Morning proceed to Bikaner, upon arrival transfer to hotel Palace View. Afternoon visit Junagarh Fort and Camel Breeding Farm. Rest day at leisure. Overnight at hotel. Breakfast at hotel. Morning drive to Khimsar....a Jewel in Desert. Rest day free for own activities. Overnight at hotel. Breakfast at hotel. Morning drive to Jodhpur. Short city tour and walk around the local bazars (market). later proceed to Rohet, upon arrival transfer to Rohetgarh. Overnight at hotel. Breakfast at hotel. Morning drive to Udaipur. En-route visit Ranakpur Jain temples, famous for Centuries old Temples with marvellous peice of architecture, upon arrival in Udaipur transfer to hotel Rangniwas Palace. Rest day at Leisure. Overnight at hotel. Breakfast at hotel. Morning leave for half day guided city tour. Afternoon excursion to Eklingi & Nagda. Rest of the day at leisure. Overnight at hotel. Breakfast at hotel. Morning leave for Pushkar, upon arrival transfer to hotel Pushkar Palace. Rest day free to Explore the Holy city visiting various temples not to mention the temple of Lord Bharma (The creator accoring to Hindu mythology). Breakfast at hotel. Morning proceed to Jaipur, upon arrival transfer to hotel Alsisar Haveli. Afternoon half day city tour, visiting Hawa Mahal, City Palace Musuem, The Observatory, Birla Temple and other places of interest. rest of the day at leisure. Overnight at hotel. Breakfast at hotel. Morning leave for guided Excursion to Amer Fort. Enjoy short Elephant ride to the fort. Rest of the day free for own activities. Overnight at hotel. Breakfast at hotel. Morning Proceed to Agra, one the way visit Fatehpur Sikri- Teh desterted capital of Mughals. Upon arrival in Agra transfer to hotel Clarks Shiraz. Afternoon visit Taj Mahal (One of the Seven wonders of the world) and Red Fort. Overnight at hotel. Breakfast at hotel. Morning proceed to Neemrana, upon arrival transfer to hotel Neemrana Fort- The magnificient Fort converted into Heritage hotel. Rest day at leisure. Overnight at hotel. Breakfast at hotel. Early evening drive to Delhi, upon arrival transfer to some local resturant for dinner and transfer to airport for onward international flight.